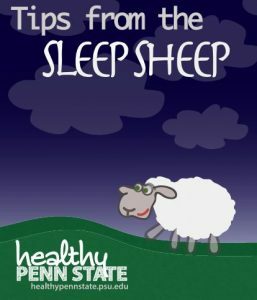 Penn State students ranked sleep difficulty as the third highest health issue affecting their academics. Get 7 to 9 hours of sleep! This will maximize your learning, memory, and academic performance. Relax! Create a pre-sleep ritual. Get ready for bed each night by practicing deep breathing or listening to relaxing music. Stop by 201 Student Health Center to pick up your free sleep kit. It includes an eye mask, earplugs, and tips from the Sleep Sheep on how to get a better night’s sleep. Healthy Penn State. University Health Services, n.d. Web. 28 Mar. 2017.